April 16, 2012 — Last week news emerged of proposed legislation that Jefferson County had been anxious to keep under wraps: A bill that could clear the way for future construction of Denver-area beltway-related projects by paving over Colorado’s tradition of local control. Why has this bill been drafted in secret in the last month of the legislative session? And why were some area municipalities that would be impacted by its provisions intentionally left in the dark? A review of the draft bill’s language provides insight as to why Jefferson County officials may have been so eager to hide it from public scrutiny. The bill, which remains in draft form, would create a “Beltway Completion Authority,” a whole new layer of government with unprecedented powers to override local control of municipalities and counties throughout the Denver metro area. Colorado local governments have increasingly opted for regional cooperation to move our communities forward. This draft legislation would be a huge step backwards from that goal, amounting to a divisive power play that puts the desires of a few powerful interests over the needs of other communities. Colorado’s historic respect for local control was reaffirmed by the Colorado General Assembly 38 years ago with the enactment of House Bill 74-1041. Known since then as “1041 powers,” this time-tested law allows local governments to maintain their control over particular development projects even where the development project has statewide impacts. The projects covered by this law include the construction of airports, power plants, sewage treatment facilities, light rail tracks and waste disposal sites. Without these 1041 protections, local communities could have projects in these categories foisted upon them without any recourse or community protection. The proposed legislation, as initially drafted, would eviscerate 1041 powers specific to one issue – construction of beltway-related projects in the Denver metro area. In addition, it would create a dangerous precedent that could have even broader and longer-term implications, suggesting that a few well-connected interests be allowed to steamroll Colorado’s historic commitment to local control anytime these protections prove inconvenient. Furthermore, the bill proposes to give a new authority a sweeping power of “dominant eminent domain” that would allow it to take any property it wants from any other local government, no matter how important the purpose. Target communities would have no defense if the authority’s unelected board of directors sought to seize parks, schools, college land, water works, open space or other facilities paid for and planned by the community. Community organizations, environmental groups and the communities of Golden and Superior have raised significant concerns about serious implications of the proposed Jefferson Parkway toll road on the Rocky Flats National Wildlife Refuge and the neighborhoods and citizens that surround it. Golden participated in extensive negotiations late last year with Jefferson County, Arvada, the Jefferson Parkway Public Highway Authority and the Colorado Department of Transportation. 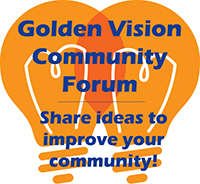 Although those discussions ended without an agreement on transportation issues related to the Jefferson Parkway, Golden made it clear then that it remains open to a negotiated solution that respects the needs of Golden’s citizens. It has continued discussions with Jefferson Parkway proponents since that time.